IMPD SWAT Patrolman Richards was heading home from his shift in his police car traveling on I465. Traffic began to slow and he could see a car had just struck the back end of a semi-truck. He parked off to the side, grabbed his Trauma Kit and ran towards the car. He quickly assessed the lady driving the car, realizing her arm had been completely severed. He pulled out the CAT Tourniquet from the kit and applied it quickly. At that point, her coloring was very gray, she was initially unresponsive. It would be four more minutes before the State Police and EMT’s arrived. In situations like this, seconds and minutes count. The loss of blood from a severed arm or gunshot wound is excessive. For this citizen, the time was short for her to receive life-saving treatment. 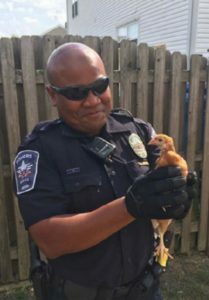 With Patrolman Richards arriving so quickly and having the tools and training to treat her, her life was most likely saved. The Trauma Kit saved another life. ‘These kits and the training are vital for officers. We are the first responders and the first to begin care for the injured,’ said Richards. The other situation for use of Trauma Kits is treatment of officers themselves in active shooter situations. The Kits were designed with the right tools and training so that an officer may be able to treat him/herself or to take care of one of his team. 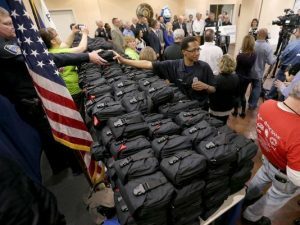 CIPF has provided over 1800 Trauma Kits to Officers in Central Indiana. We also require each officer receive training on how to properly use each item in the kit. Police Departments then commit to keeping the kits supplied and offer refresher training. We need another 1800 Kits to make sure every sworn officer has one in our territory.